Neuro-Immune Pro is a scientifically formulated blend of nutrients specifically designed to boost cellular and mitochondrial energy production, maximize antioxidant capacity, support detoxification, and strengthen immune response. 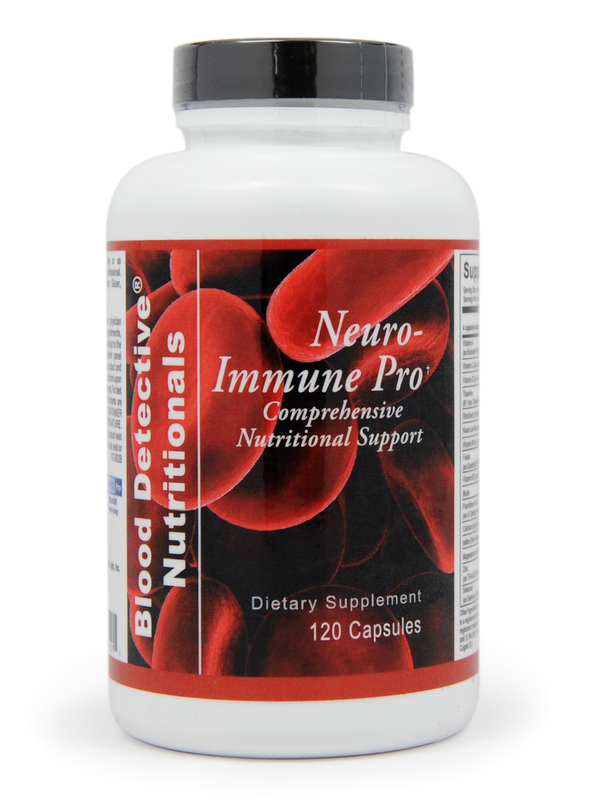 Based on peer-reviewed, double-blind research, Neuro-Immune Pro provides a unique blend of acetyl L-carnitine, alpha lipoic acid and N-acetyl cysteine. All have shown to produce a dramatic increase in immune function and energy output. Neuro-Immune Pro also includes key micronutrients and phytonutrients, including green tea, broccoli seed extract and resveratrol, to protect the mitochondria and continually renew the cycle of energy production. The body’s cells and organ systems depend on an adequate supply of energy to function optimally. The mitochondria, known as the power house of the cell, contain nutrients and enzymes that are important for cellular energy metabolism. Some of these enzymes convert food to usable energy in the form of adenosine triphosphate (ATP). ATP functions as the key source of energy for all cells. In order to increase mitochondrial output, there must be adequate fuel supply for combustion and abundant antioxidants to scavenge free radical by-products. Preserving our energy reserves and increasing energy output is a critical part of maintaining optimal health. There are many things that can drain our energy reserves. Lack of sleep, too much stress, poor nutrition and prescription medications can draw on our energy reserves, using them up faster than they can be replenished. Even the vital biologic systems we rely on to maintain health can create an energy deficit that needs to be restored. Neuro-Immune Pro is scientifically formulated, based on published research, to boost mitochondrial reserves and jumpstart cellular energy production. Neuro-Immune Pro includes the powerful antioxidant trio of alpha lipoic acid, N-acetyl cysteine and acetyl L- carnitine, all shown to increase energy production and recharge the primary cellular antioxidant pools of vitamins E and C and glutathione. a compound that is a precursor to sulphoraphane. antioxidant- probiotic- and immune- supporting properties. increasing energy output and meeting daily nutritional needs. mitochondrial decay in aging. Proc Natl Acad Sci U S A.
Sci U S A. 2002; 99(4):1870-1875.
ceramide generation. Clin Immunol 1999; 92(1):103-110.
and tissues. J Clin Chem Clin Biochem 1990; 28(5):307-311. 6. N-Acetylcysteine. Altern Med Rev 2000; 5(5):467-471.
enzymes. Food Chem Tox 1999:37:973-979. 13. Green Tea. Altern Med Review 2000; 5(4):372-5. Neuro-Immune Pro is a scientifically formulated blend of nutrients specifically designed to boost cellular and mitochondrial energy production, maximize antioxidant capacity, support detoxification, and strengthen immune response. Based on peer-reviewed, double-blind research, Neuro-Immune Pro provides a unique blend of acetyl L-carnitine, alpha lipoic acid and N-acetyl cysteine. All have shown to produce a dramatic increase in immune function and energy output. Neuro-Immune Pro also includes key micronutrients and phytonutrients, including green tea, broccoli seed extract and resveratrol, to protect the mitochondria and continually renew the cycle of energy production. Preserving our energy reserves and increasing energy output is a critical part of maintaining optimal health. There are many things that can drain our energy reserves. Lack of sleep, too much stress, poor nutrition and prescription medications can draw on our energy reserves, using them up faster than they can be replenished. Even the vital biologic systems we rely on to maintain health can create an energy deficit that needs to be restored. To increase cellular energy production efficiently, optimal levels of critical nutrients and enzyme cofactors must be achieved. Neuro-Immune Pro is an energy-providing multivitamin with an optimized backbone of vitamins and minerals necessary for increasing energy output and meeting daily nutritional needs.